Bobby is from San Diego, California. He has been married to his wife Cheryl for 18 years. Together they have four grown children, and two Grandchildren. Before coming to Crossroads Church, Bobby was the Sr. Pastor at Bethel Flock Baptist Church in Louisville, Kentucky while attending seminary. Bobby graduated from The Southern Baptist Theological Seminary in 2018, where he received his Master of Divinity in Christian Ministries. Prior to coming to Kentucky for seminary, Bobby served as an elder at Pacific Hope Church in San Diego. Prior to that he served as a full-time children’s pastor at San Diego Christian Worship Center in San Diego. Some of the things Bobby really loves are, spending time with Cheryl watching football, baseball, and golf. He also loves spending time with his children and grandchildren. Bobby is an avid reader. He loves to read the Puritans and other theological books. Some of his favorites are, “Holiness” J.C. Ryle, “Institutes of the Christian Religion” John Calvin, and “Great Doctrines of the Bible” Martin Lloyd Jones. I attend Crossroads with my wife April and 18 year old son Gabe. Although born in New Delhi India, I grew up in Helena Montana and have lived in the Bozeman area since the 1980’s. I currently work as the purchasing manager at Music Villa where I have been a key employee (on and off) since 1989. I have also worked as a manufacturing representative for several music companies and have traveled and preformed professionally as a bass player and drummer around the US and Canada. Currently serving as deacon at Crossroads I also help lead worship in our Sunday services. I have a heart for the greater "Church" and love to see believers interacting as the total body. I've been very involved in many area churches over my time in Bozeman, however Crossroads is the first I've felt lead to become a full member of. It is my dream to see us all learn to love one another and be that beacon of hope and refuge for those searching. I attend Crossroads Church with my wife, Cindy, and our four children (Reece, Isaiah, Deryk and Rachel). I grew up in Georgia and moved to Montana in the summer of 2014. I work for a technology company that does business around the US. I like to do woodworking and make things with my hands. My passion is to see a world that is Christ-centered and focused on the reality that our Savior lives, he is seated on His throne and that he desires ALL to come to a saving faith in Him. Despite his brutish, unsophisticated personality, Jeff is significantly tempered by the Holy Spirit, and his marriage to the lovely and gracious Calie. Together they have 4 children, a daughter-in-law, and one grandson. 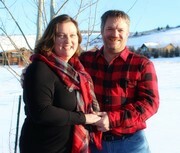 Jeff was saved by the Lord at age 24 at a small church in a very rural Montana town. His affinity for playing with electronics eventually turned into his vocation, and now he earns a living in the field of neurological research tools. In addition to building guitar amps, he enjoys cooking, rousing political debates, and playing guitar too loud for the glory of God. And coffee. As a boy growing up in northwest Montana, Tye could be found riding his horse through the mountains, hunting, and learning to love God's country. Not much has changed in 40+ years. After a brief hiatus in Oregon and Washington, Tye, with his wife Sara and two children; Audrey, 16 and Jackson, 14 returned to the Gallatin Valley where they have lived for 5 years. Tye was baptized into Christ at the age of eleven and credits his dedication to God to a strong legacy of faith passed along by his grandmothers and mother. Later, his wife's example of devotion would also help shape and encourage his journey. Tye continues to be an avid hunter and enjoys spending time with his family, as well as serving at Crossroads Church.